The largest scale raised relief maps are at a scale of 1:250,000, which equates to four miles per inch. 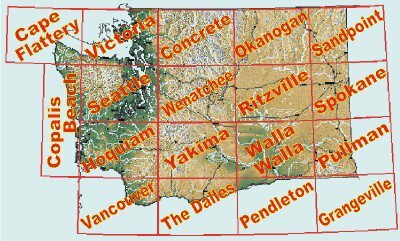 We carry all of the available maps at this scale that cover most portions Washington. Since these raised relief maps of Washington are all done at the same scale, adjacent titles can be pieced together for a larger wall display if desired. Each raised relief map measures 21" x 27", and has a generous border on all four sides. The map below shows the location of each title in relation to each other. 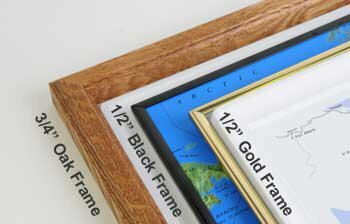 Framing options are available for most of the raised relief maps, either oak wood frames or sturdy plastic frames in either black or gold. The oak frame is 3/4" thick, and the plastic frame is 1/2"...options and prices are listed with each map.